For any sighted community member, Deaf and hearing. Does not include CEUs. For all DeafBlind Community Members. This includes registration for both Saturday and Sunday. Please request services and accommodations 7 days in advance. For Interpreters wishing to receive RID CEUs. If Question or Request for Accommodation Service, email at SCADBInfo@gmail.com. The deadline for accommodation services is one week prior the date of the first workshop. The DeafBlind and Sighted communities both experience some kind of awkward and uneasy feeling in working together, not sure which and what the best communication method is. This workshop is a perfect opportunity to have a quick preview of the most appropriate communication approach in the community. This workshop will also discuss the ProTactile movement that has changed the DeafBlind community. The workshop will include individual and group activities that would help. Visual information exposes us to our surrounding in several essential ways, and being able to convey what you see and the impression you get is the goal in working with DeafBlind community. The workshop will discuss visual orientation including mood, style, feeling and culture. With two DeafBlind Persons of Color, the workshop will include culture sensitivity in describing visual surrounding. DeafBlind individuals will engage in a discussion with the attendees regarding their experiences in various settings, sharing their struggles, successes, and excellent anecdotes that occurred along the way. This workshop is intended to encourage the attendees to connect with the DeafBlind community, so they can have better understanding how they can be more involved with the community. This workshop presents an overview of the lives and perspectives of DeafBlind people and the various roles and relationships of Support Service Providers (SSPs) and DeafBlind Interpreters within the DeafBlind community. Basic level knowledge and experiential activities around meeting, socializing, and working with DeafBlind people in a variety of settings are provided. The roles of Support Service Providers and DeafBlind Interpreters are often overlapped, so this workshop is an opportunity to redefine responsibilities and expectations of Support Service Providers and DeafBlind Interpreters. Trix Bruce is an Approved RID CMP Sponsor for continuing education activities. This workshop is offered for a total of 0.7 CEUs (Saturday) and 0.4 CEUs (Sunday). All are professional studies CEUs. Roberto Cabrera is a Senior Vocational Rehabilitation Counselor for Deaf, DeafBlind, DeafDisabled, Late-Deafened and Hard of Hearing (DDBDDLDHH), and in evening hours Roberto is teaching American Sign Language at local community colleges. Roberto is a core team member of Western Oregon University's DeafBlind Interpreting National Training and Resource Center. Roberto is representing different organizations: Council de Manos, California Manos del Corazon, and Southern California Association of the DeafBlind. As an active community member, Roberto has embraced his intersectional identities—Second Generation DeafBlind, Dominican and Queer. Besides community involvement, Roberto loves chatting with people and loves learning new technology to make life easier. Image description: Image of a Dominican male wearing a blue buttoned down collared shirt. The image is zoomed in to his head and shoulders. He is sitting in front of a body of water smiling directly at the camera. Elias Davila is a Mexican and was raised in Illinois, and he was graduated from Illinois School for the Deaf. Currently, he is the Vice President of Southern California Association of the DeafBlind, and he is in leading team in giving DeafBlind Seminars in Southern California. He is happily married with children living in Southern California. Image description: Brown-skinned Mexican with black hair and goatee, wearing a striped shirt in a background of inside car. He smiles at the camera. Kimberly Han, DeafBlind and Korean American graduated from California State University, Northridge in Psychology then went to Gallaudet University for her Masters in Counseling. She also interned at New Mexico School for the Deaf before settling down in California. Kimberly previously worked as counselor at Mount San Antonio College in Walnut, California. As a Etsy shop owner, Kimberly creates and sells her face creams made of natural ingredients called Naturally Suzee. She is currently involved with a nonprofit organization, Southern California Asian Deaf Association as a social media manager. During her free time, Kimberly enjoys travel, talking about skincare, and trying out new food. Image Description: A slightly tan skinned Korean American woman in her late 20s with dark brown and short length hair, Kimberly is wearing black polka dots dress and gold necklace. She is sitting and behind her are green hills. Julian Castaneda is the Treasurer of Southern California Association of the DeafBlind, He is DeafBlind and is involved with the DeafBlind community as a volunteer for various organizations. He is also interning at Braille Institute of America (BIA), working with the publishing team ensuring reading materials accessible to DeafBlind and Blind individuals. At BIA, he is also hosting and teaching American Sign Language classes on weekly basis. In off hours, he loves feeling music and loves walking with Chihuahua. Image Description: with the blue wall in background, Julian is wearing an orange shirt with company logo, smiling toward the camera. Ashlea Hayes was born and raised in Compton, CA. Through ear infections as child, and and a genetic condition, she lost her hearing. She was bitten by the acting bug in 2009, stemming from her love of story telling as a child. Ashlea has been active in the deaf community for 23 years. She has been involved in several community organizations, all with the goal of empowering the Deaf community as well as educate the Hearing community about Deaf Culture. When she isn'tvolunteering her time to the community, she is teaching ASL at Fusion Academy and is an adjunct professor at West LA College. She also currently works in the ASL lab at El Camino College, and she sharpens her acting skills when she can. She is a gospel mime and has been able to travel around the LA area dancing for the last 14 years. Her study of acting has afforded her with being a background character on FreeForm’s “Switched At Birth”. Image Description: with the blurry background, Ashlea is wearing a green shirt with big Gold earrings, smiling toward the right side of the picture. served on numerous committees and boards of Latinx Deaf, DeafBlind, DeafDisabled, Hard of Hearing and Late-Deafened (DDBDDHHLD) and sign language interpreter organizations. 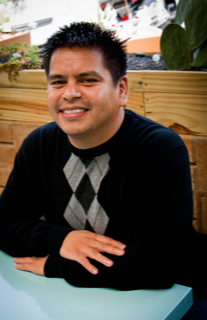 Roberto is the Chair of California Manos del Corazón (formerly California Latino Council of Deaf and Hard of Hearing), the non-profit organization dedicated to promoting Latinx DDBDDHHLD communities in the state of California. He is serving as Deaf Member-at-Large of Mano a Mano (MaM), the national professional ASL/Spanish/English trilingual interpreter organization, and he is the first Deaf board member on the MaM Executive Board. Roberto’s participation on the MaM Board marks the beginning of much collaboration between Deaf and hearing interpreters who work in Spanish- influenced settings. He has been involved with MaM since 2013. Roberto was elected and is currently serving as Co-Chair of National Deaf Interpreters (NDI), the new national professional Deaf interpreter organization. Image Description: Brown-skinned Chicano with black hair wearing a black sweater with a grey-scaled checker pattern down the front and black long-sleeves in a background of outside. He smiles at the camera.